Willoughby has an itch he can't reach. An itch he can't scratch. Not just a little itch, a TERRIBLY ITCHY ITCH. Nothing he does will make it go away. What can a dragon do when he has an itch he can't reach? He calls for help, of course! See how some unlikely friends get together to relieve Willoughby of his terribly itchy itch. Willoughby is a young, somewhat clumsy, gentle dragon who is learning to live and interact with friends from the the Land of Dern. 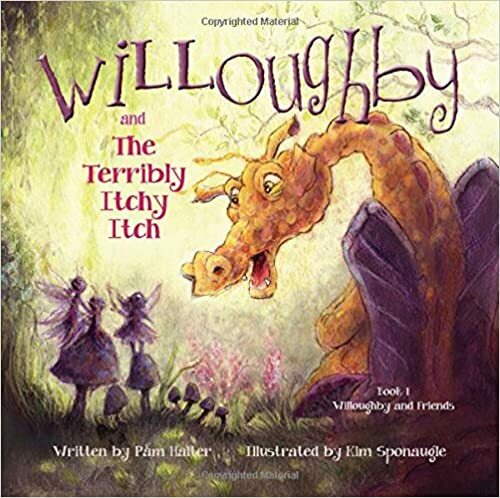 In this picture book series for ages 4-8, Willoughby learns about friendship, getting along with creatures different from himself, and discovers he can do things he never thought he could. I was inclined to like this because DRAGONS! So I chose it as an extra Easter basket gift for my five-year-old. I read it to her. She immediately asked for an encore performance, then walked away holding it saying, "I really like this book." Really nice simple text, gorgeous colorful pictures, and Claire had a hard time picking her favorite fairy because she liked all three.